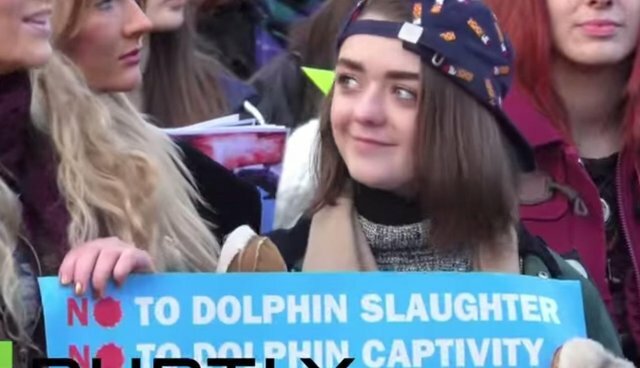 "Game of Thrones" star Maisie Williams is fighting a new battle: the annual brutal dolphin hunt in Taiji, Japan. The actress marched with 2,000 other protesters in London on Saturday, in advance of Prince William's February visit to the country. The protesters are calling on the Duke of Cambridge, an outspoken advocate for wildlife, to discuss the annual drive hunts with Japanese leaders. Noted conservationist Dominic Dyer, who is also a spokesman for the rally, told the Press Association that Williams' participation was a promising sign. "She's reaching out to the younger generation. That's what we need - for young people to be saying, 'I don't want to participate in this business anymore, I want it stopped,'" he said. Fueled by the high demand for dolphins in captivity, the hunts capture dozens of marine mammals and slaughter hundreds more. See this page for information on how to help end Taiji's brutal dolphin hunts.